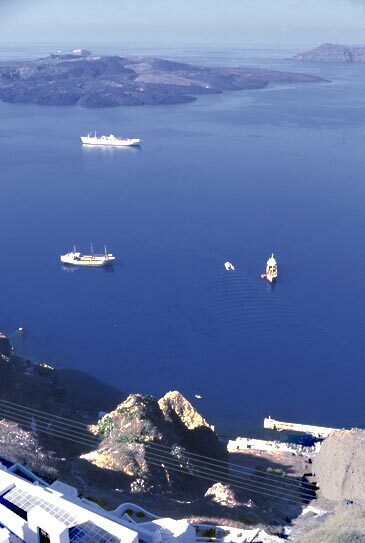 Santorini is unique - the detritus of a giant volcanic eruption. White villages adorn the rim of the crater like icing on a cake whose bottom has dropped out. 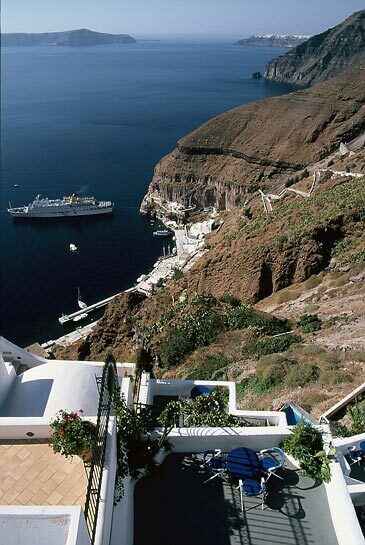 It is a popular cruise stop, making the capital, Fira, rather frenetic when the fleet’s in; but its position overlooking the Caldera atones for everything and it’s a good base. In fact the villages don’t stop at the rim, but cascade (increasingly each year) down the sheer face of the cliffs, with much of the accommodation being housed in the Gruyere-like caves and indentations; vaulted bedrooms carved into the rock are all the rage – the more their construction owes to Nature the more the owners charge for them. 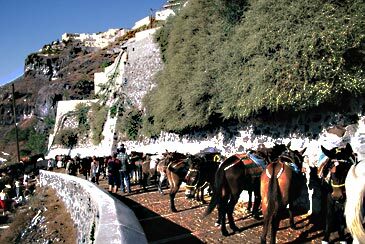 The archaeological site of Akrotiri, dating from 1500 BC, is a must, as is a boat trip across the Caldera to the other main island of Therasia, visiting on the way the "Burnt Islands" of the crater for a swim in the sulphur springs. On these islands there are hot sulphureous fumaroles so, if you happen to have a frying pan and a couple of eggs on you, you may cook breakfast on the hoof. 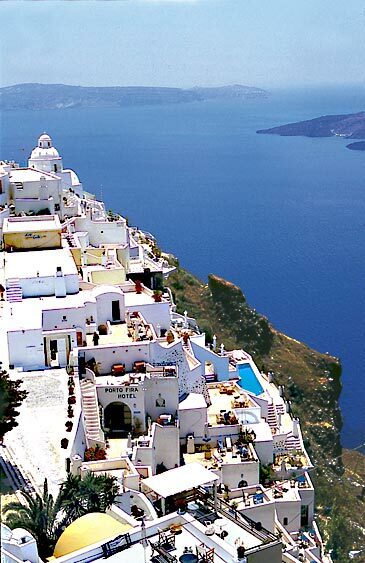 Fira (confusingly, the Greek name for the island Santorini is Thira) is amazing, most of it being built into the almost vertical cliffs. Along the rim, the pedestrian lane is packed with fashionable shops and bars where you can drink something whilst you also drink in the view. It’s not cheap. 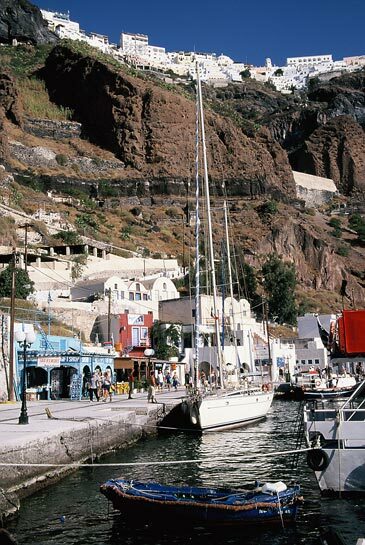 At the tip of the island is Oia where, again, accommodation has been carved out of natural caves; it’s fascinating to wander round and well worth walking to the end and taking the stepped path down to the tiny port (and nearby beachy) of Ammoudi, with its fish tavernas for lazy lunches. 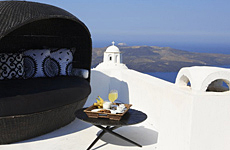 Oia is gradually becoming a mini-Fira (though much quieter), with new hotels in panoramic settings and plenty of shops, tavernas and even some night-life of its own. 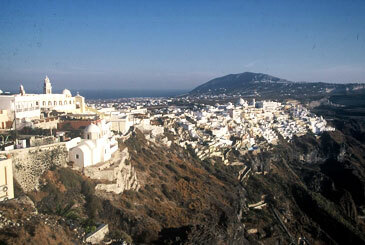 The eastern coast is the “flat” side of the original mountain whose centre dropped out some 3,500 years ago. At the northern tip facing Ios there is a long, if often windy, sandy beach whilst as you go south the beaches turn a volcanic black – oddly, that’s where the Martians mostly stay, particularly at Kamari and (just south of a forbidding mini-mountain) Perissa which we recommend should be visited only by incorrigible voyeurs of Martian life. 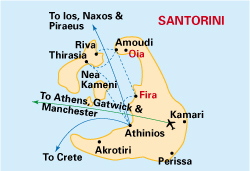 There are direct charters on Tuesdays from Gatwick and Manchester to Santorini and direct scheduled flights 2-3 times a week from Gatwick. Alternatively you can fly on any day from Heathrow to Athens and continue either by domestic flight or take one of the increasing number of fast ferries from Piraeus. 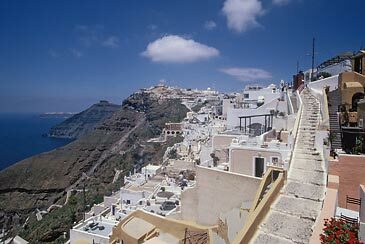 On the cliff path just outside Fira. They cascade down the cliff-face to an attractive swimming-pool with bar and lounging space. Most are vaulted rooms hewn out of the rock face. Studios for 2, apartments (2 rooms, 2 bathrooms) for 4-5. Air-con; satellite TV. S/C 2-5 pers. 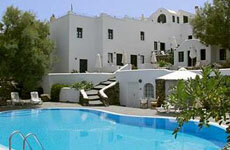 Right on the ridge path, all the rooms have balconies with unrivalled views across the caldera. 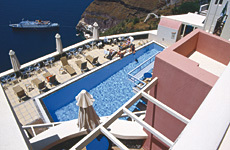 Clients may use the swimming-pool of Caldera Villas which the hotel overlooks. Cat.B; air-con, TV, phone, fridge, mini-bar. B&B. 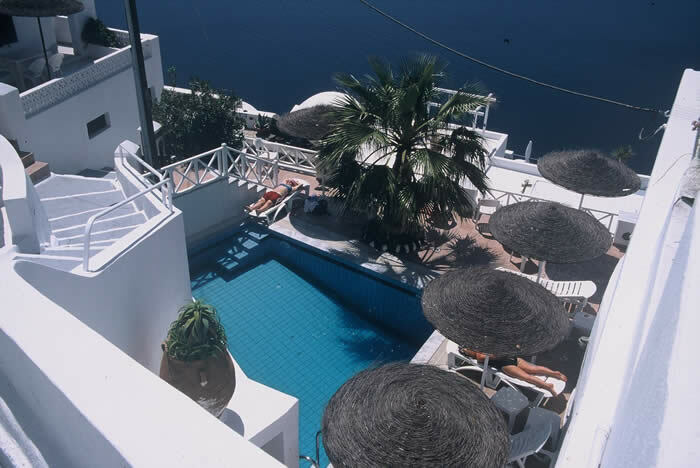 Another small complex of about 14 studios nestling round and above a swimming-pool, all facing across the caldera to the Burnt Islands. Almost brand new, they offer a very high standard. Air-con, sat TV, phone, balc with full SV. S/C 2-3 pers. 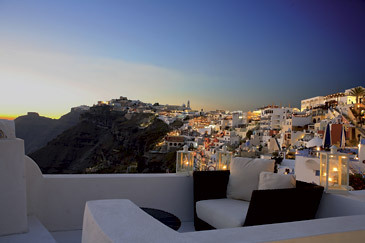 Peaceful location on the edge of Oia with a wonderful view across to Ios. There are hotel rooms plus s/c studios and apartments, some being traditional cottages with spiral staircases and vaulted living rooms. 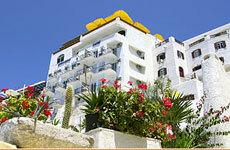 All have built-in beds on concrete bases and balconies/terraces with sea view. There’s a kidney-shaped swimming-pool with bar and a restaurant at the upper level. Cat.C. B&B or S/C 2-5 pers. 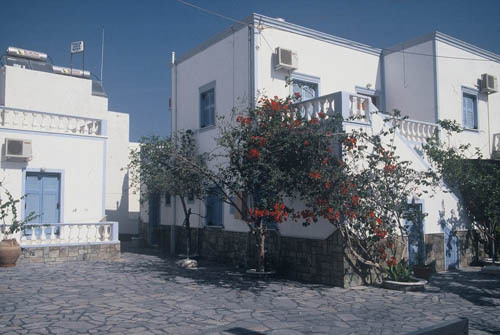 Perfect for an economical stay, 300 metres from the main square, buses etc, but quiet. Simple rooms, reception, flowery courtyard, breakfast area and a small pool from which there’s a nice view down to the east coast. Cat. A Pension; TV, fridges. B&B. Very central with large pool, but near everything so not the quietest spot. 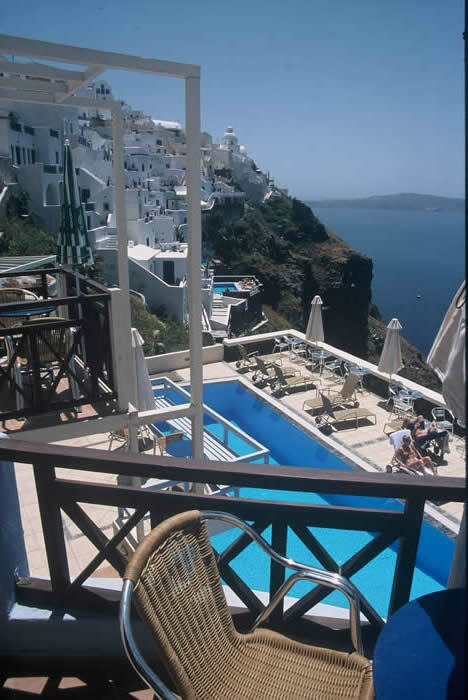 The last word in inspired and tasteful luxury, this villa is just below the cliff path with superb views across the caldera by day and of the magical lights of Fira by night. 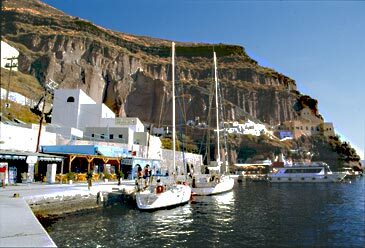 For those who want the black sand beach of Kamari to hand in spite of the tourists, this haven of peace in a backwater corner at the quieter end of town almost nestles below the mountain of Ancient Thira, with lots of good local tavernas nearby. A pool and bar if you are feeling too tired to walk the 200m to the beach after the superb buffet breakfast, and a real Greek family welcome. Located on the edge of Kamari Beach in a quiet part of the village, Chez Sophie offers a selection of rooms and apartments in a charming villa complex. Each room has all modern conveniences including satellite tv, air conditioning, hair dryer, small refrigerator and safe. 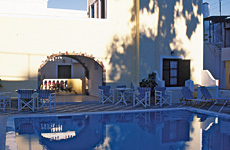 Each room also has a balcony or veranda with views towards the sea or to the imposing mountains inland. When you're not out exploring this stunning island, you can also relax and enjoy time by the pool. 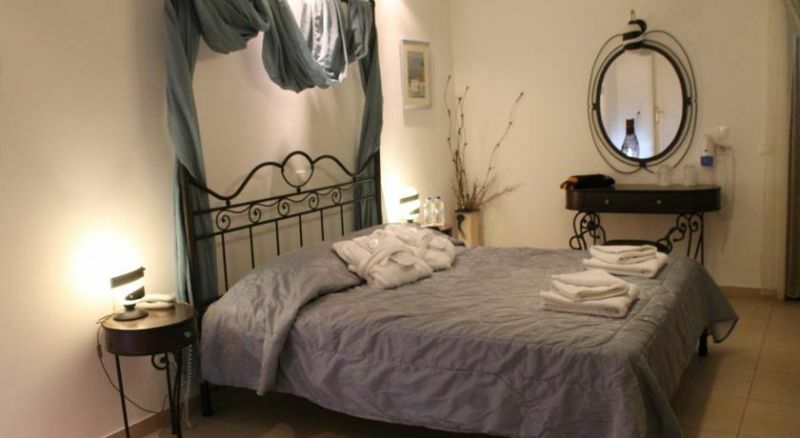 Tina and Giorgio will offer you the best of Greek hospitality during your stay.